Collagen is a natural protein that is produced by the human body. But as we grow older, our collagen production gradually slows down – leading to the formation of unsightly wrinkles, weaker joints, and brittle hair. Keep your collagen levels high at all times by taking Quamtrax Collagen! Quamtrax Collagen delivers rich amounts of hydrolised natural collagen in an easy-mixing, unflavored powder. This makes it easier for you to infuse your protein shakes, fruit juices, or sports drinks with collagen without altering their taste. What benefits do you get by taking collagen? Get even more benefits with Magnesium! Quamtrax Collagen is loaded with an additional 75mg of Magnesium, an essential mineral that has been shown to improve cellular hydration, promote normal muscle function, and prevent the occurrence of muscle cramps, especially during exercise. Look young, feel young, and get more out of your active lifestyle... supplement with Quamtrax Collagen today! 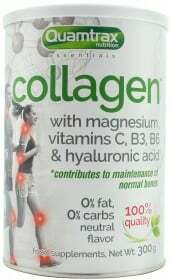 Does this Collagen have Hyluaronic Acid? Have a question about Collagen? What is it, what does it do, how and when to use or something else? Ask us. Take 1 serving (12g) daily dissolved in milk, water, juice or your favorite beverage. WARNINGS Collagen : Food supplements should not be used as a substitute for a varied and balanced diet and healthy lifestyle. For adult use only. Do not take if pregnant or nursing. These statements have not been evaluated by the Food and Drug Administration. This product is not intended to diagnose, treat, cure, or prevent any disease. Keep out of reach of children. Do not exceed recommended daily dosage!